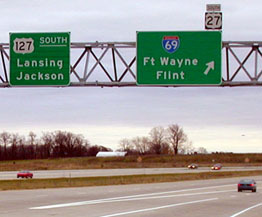 At the time, the south terminus of US 127 was Toledo. But in 1930, US 127 was rerouted to go south from Somerset MI (as it does today), so US 223 was commissioned to replace US 127's original segment between Somerset and Toledo. From then until 1958, its southern terminus was in Cincinnati. Then US 127 was extended to its current southern terminus in Chattanooga. ...but in 2002, the US 27 designation was removed from I-69, and now it does not begin until all the way down in Ft. Wayne IN. 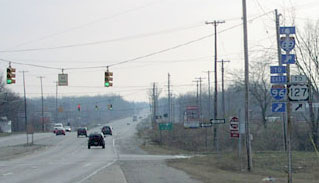 That "South 27" sign has been removed, and that interchange no longer marks the north beginning of US 127.